Synopsis (from the publisher): An elderly priest is nearly beaten to death and a special-needs boy is brutally attacked. Evil has many guises and Jack Taylor has encountered most of them. But nothing before has ever truly terrified him until he confronts an evil coterie named Headstone, who have committed a series of random, insane, violent crimes in Galway, Ireland. Most would see a headstone as a marker of the dead, but this organization seems like it will act as a death knell to every aspect of Jack's life. Jack's usual allies, Ridge and Stewart, are also in the line of terror. 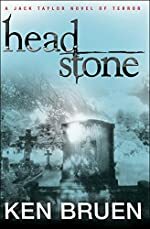 An act of appalling violence alerts them to the sleeping horror, but this realization may be too late, as Headstone barrels along its deadly path right to the center of Jack's life and the heart of Galway.